GRAND LAKE, Colo. – Shadow Mountain Lake is notorious for its “poor” fishing, but the code may have been cracked. Ah, Grand Lake. Home of majestic views, summer fun, ridiculously large homes, and very good fishing. The deepest lake in the country houses some of the largest Lake Trout you will ever see and, even though the population is dwindling, you are still pretty much guaranteed to pull a few off the lake bed on a good day. This narrative is not the same for Grand Lake’s neighbor Shadow Mountain Lake. Shadow Mountain is one of the shallowest lakes for its size in all of Colorado finding a max depth of about 24 feet compared to Grand Lake’s max depth of about 400 feet. When fishing for Lake Trout you want depth. I just caught three over the Fourth of July at depths of 114,150, and 175 feet. Obviously with Shadow Mountain it makes Lake Trout Fishing difficult. “I’ve lived here for 30 years, and have only caught about five Lakers in Shadow Mountain,” Jeff from Granby said. Do not fret my fishing catching friend. I have cracked the code. Everyday there is always two prime times to go fishing. Right at dawn and at dusk. This is when fish come up and feed on bugs, and other things that fall in the water. This is when you need to go. Don’t waste your time fishing this lake mid-day. It’s not worth it. Only fish in the summer, early in the morning, or just as the sunsets. I have success using the same lures every-time. I catch fish almost every night right off my dock. 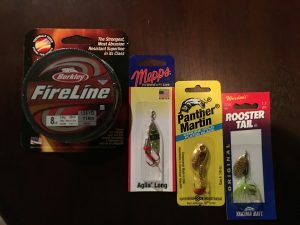 Simple Mepps, Panther Martin and Worden’s Rooster Tail spinners with a gold blade are pretty much guaranteed to land you a big one! 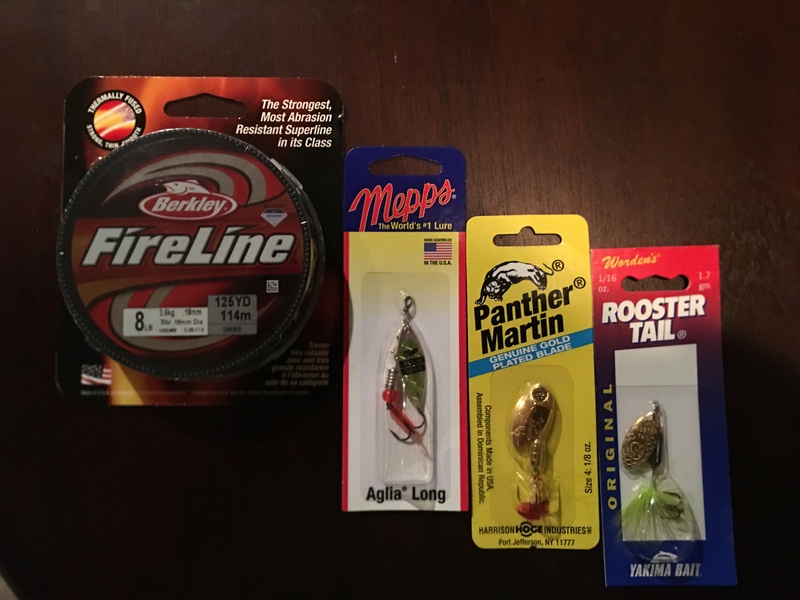 These lures all run about three to $5 a piece. Something else that has been known to work at these times of the day are, oddly enough, certain Bass lures. Specifically topwater. If you think about it, it does make sense though. 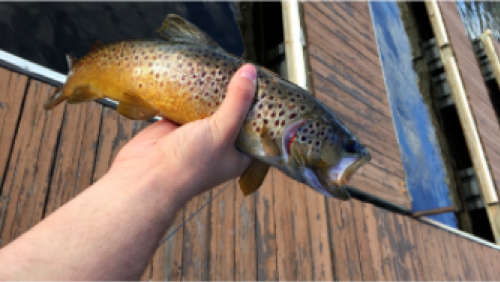 These Brown and Rainbow Trout are feeding off the surface, so what you want to do is buy a small Bass lure. Lately the Rebel Teeny Pop-R has worked very well. The Arbogast Hula Popper has been working wonders as well these will cost about five to $6. “Yeah, I caught two Browns and a Rainbow right at dusk last week. I was just using a spinner and even worked in a spoon too. But the spinner seemed to get me lots of interest, and I bent some rods and caught some fish. Never anything wrong with that!” Fritz Wiegman, an avid angler and resident of Grand Lake said. The previous narrative was supposedly set in stone about the fishing on Shadow Mountain Lake, but really if you stay consistent in the times of day that you go after it, and keep steady with the lures you will land fish. 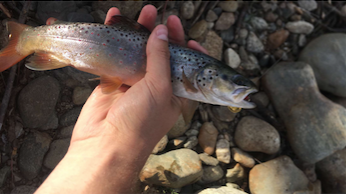 The Brown Trout population in Shadow Mountain is booming, and they are very healthy fish. Practice safe fishing, and always catch and release and your success will come. Keep up with all the latest gear to make your Colorado fishing experience the best it can be!